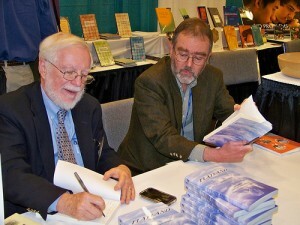 Thomas Banchoff and William Lindgren recently signed copies of their new edition of Flatland at the MAA Conference. For those unfamiliar, Flatland is a classic Victorian story by Edwin Abbott, chronicling the experiences of a two-dimensional figure’s encounter with the third dimension. Full of allusions to Victorian society – it manages to pack social satire into a mathematics lesson, and Banchoff and Lindgren’s annotated edition keeps you filled in. Laura: Do you think Abbott’s social observations apply to today’s society? Banchoff & Lindgren: Some of the depictions of life in Flatland respond to specific conditions in Victorian England, which are now mainly of historical interest. Nevertheless, many of the topics of Abbott’s satire remain relevant, for example, the superficiality of what passes for knowledge, the unreflecting deference to prevailing opinions and authority, and the treatment of women. Flatland women are mere (one-dimensional) line segments, a fitting representation of their relegation to the narrowly defined role of child-bearers and housekeepers. Polygons with so many sides that they are indistinguishable from circles have a vested interest in maintaining their power, something as true about our leaders today as it was in Abbott’s time. Laura: Have you ever used Flatland to teach students about mathematics? B&L: We have used the book in multi-variable calculus, non-Euclidean geometry, and differential geometry, as well as liberal arts mathematics classes. We constantly encourage students to think in terms of dimensional analogies. Theorems about squares and circles in the Euclidean plane lead to corresponding results about cubes and spheres in three-dimensional space. There is no better way to introduce students to this process than to appeal to the story of Flatland. By encouraging students to empathize with the limited perspective of a square confined to the plane, we enable them to appreciate solid geometry, both synthetic and analytic, and to generalize results to higher-dimensional geometry. Laura: How many of your fellow mathematicians have read Flatland? B&L: Because many standard texts refer to Flatland and teachers often suggest it as supplementary reading, most English-speaking mathematicians have read at least part of it. Flatland has been translated into seventeen foreign languages, and so many international mathematicians are familiar with the story. Laura: Can a non-mathematician read and appreciate Flatland? B&L: For the past 125 years, Flatland has appealed to a wide audience for a variety of reasons: It is an extended metaphor beautifully expressed in the language of mathematics; it is a satirical commentary on Victorian society; it is a geometric version of Plato’s parable of the cave; it is an expression of religious principle; it is part of Abbott’s exposition of the role that imagination plays in the acquisition of knowledge; it is the classic introduction to higher-dimensional geometry. We hope that our notes and commentary will enable all readers of Flatland, mathematicians and non-mathematicians alike, to understand and appreciate it more fully. Laura: Disregarding what shapes symbolize in terms of social status in Flatland; if you could be a shape, which would you be and why? B&L: Since a Flatlander’s social status as well as his intelligence is completely determined by his shape, it is not easy to disregard what shapes symbolize. In terms of intrinsic beauty, it is difficult to match a regular pentagon, where the ratio of the length of a diagonal to the length of a side has been considered one of the most beautiful numbers in mathematics, the “golden ratio.” Further, it is an appealing idea to be a five-sided figure, one generation removed from the Square, who represents Edwin Abbott Abbott himself.